So I have a question if any of you are running a sub box in the extended cab. is there a product that is sold that levels that area out? if not I'm making one I just wanted to be lazy for a moment and see if there was an easy way out. I have a ported sub box back there and it's supported by blocks right now which isn't ideal. 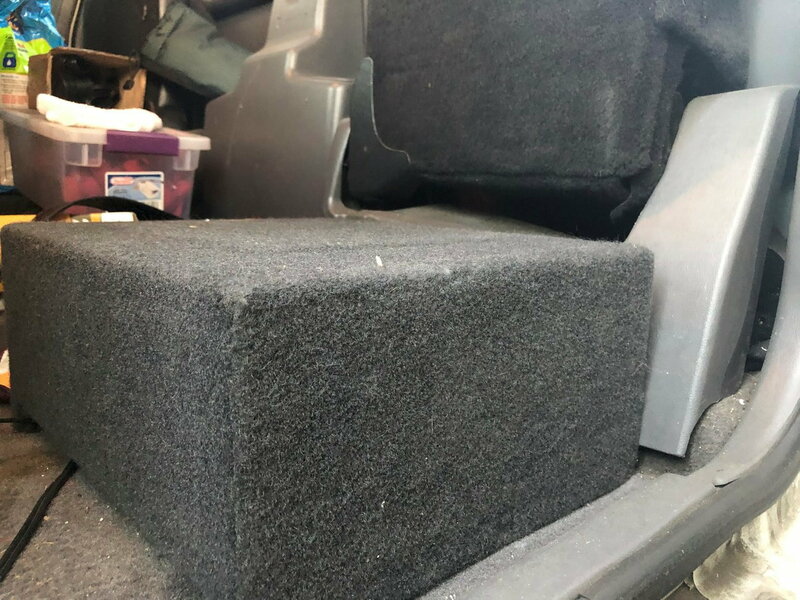 I'm sure there are that also relocate your tire changing stuffs, but Myself, I bought smaller 10" sub boxes that fit nicely under the jump seats. With the seats down, you won't even know they're there. With normal gear in there, you don't even know they're there. yeah, I'm not as low key. I have an 1100 watt amp right now with a DUAL 2x12 sub box. takes up the entire jump seat area. I'm about to rotate it so the port is faced upward instead of right against the middle of the 40 60 split. I want to be heard. i bought it already lowered so it's low and slow but loud haha. i must live in an OK area my truck was unlocked last night and everything is still in it. I also have a Raspberri Pi 3 running RetroPie installed for my kids.... well who am I kidding it's mainly for me because i'm always early for classes and i like to pass time with some Super Mario 3. I'm a big kid at heart i guess. Depending on the manufacturer, pre-made boxes may not fit exactly. You may have to pay someone to measure and fit one in there. I would go to a custom guy and make it looks finished...not just thrown in there. true but having this box still gives me room on the side for emergency tools and the kids bags when i pick them up from their mom's. i may just have to build and upholster a custom platform. Sorry but the answers no unless you want to buy a box that comes with subs and amp. Even then all I could find where tan boxes. I have the 04 ext cab no rear seats and wanted a box to cover the entire back while being down firing. Unfortunately such product does not exist. I ended up making my box and I turned out fine. It’s not hard if you got the tools take your time with it.